Thank you everyone from both Alex and I for all your lovely congratulations (and compliments) regarding the granting of his doctorate! You filled our hearts with joy and most definitely put smiles on both our faces! The lovely Jeni sent me this awesome Swiss Chalet creamer this past week! 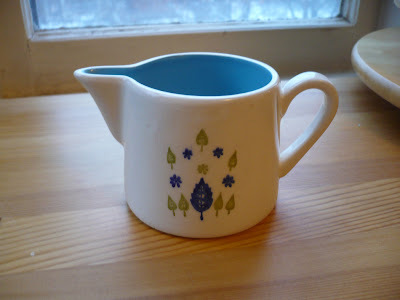 Jeni has been amassing a set (or two) of this pattern and I mentioned to her how much I liked it and that I'd love to own a creamer. As it turns out Jeni actually had two creamers so she sent this one along to me as a surprise! Thanks again so much Jeni - I just love it!! This is the Jane by Jane Richmond; the yarn is Paton's Classic Wool Merino in Maize (no longer available). I'm currently knitting myself up a cowl (Thermis) in the same yarn for those days when I want to be matchy-matchy (by the way, you can find me here on Ravelry if you're interested)! And look (! ), you can see the Swiss Chalet creamer in the hutch behind me. Also, if you look really close you might be able to spot Alex's reflection in the glass doors since he's the one who took this picture ;) Apparently we also love Danish butter cookies in this house...and have no wine...just one lonely bottle of Manischewitz which will probably never be opened! Oh yes! Very exciting stuff going on around here! And I wanted to mention how pleased as punch I am that the lovely Lurline is using my Pinwheels in the House pattern to make herself a new quilt - you can see some of her blocks here (if you read some of her more recent posts you'll see more blocks pop up) - and she's using Liberty of London fabric to boot! Now don't I feel special! I think this is the first time I've ever had confirmation that someone has actually used one of my patterns or tutorials and it feels pretty dang great! 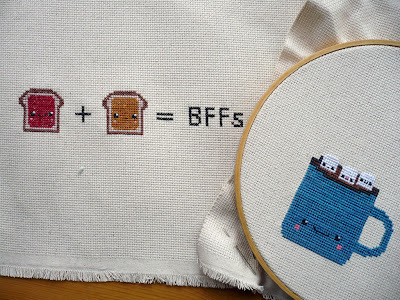 And this picture was featured on Mr. X Stitch as part of their Too Cute Tuesday series - you can see the post here! 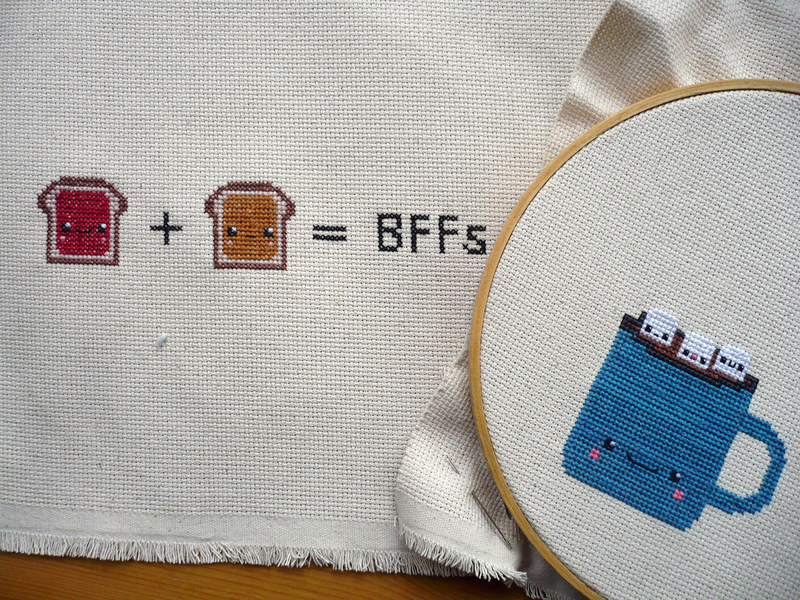 I stitched up these two patterns - Toast BFFs and Je T'aime Cocoa - using 14 count aida; the BFFs are already framed up in an oval hoop ready to go on the wall, and the Cocoa is being made into a little giftie for a very special friend of mine. Oh, and I want this cookbook when it comes out in Canada in April! Phew! Okay, that's it for now! We'll be out celebrating Dr. Alex this weekend with some friends and Sunday is the one-year anniversary of the Toronto Modern Quilt Guild (as well as the 6 month anniversary of my Presidency) - we're gonna party! I hope y'all have a great weekend if I don't see you before it's done! Okay, there ya go...anyway back to the news! Alex defended his PhD dissertation (in English) this morning, passed with flying colours, and is now a Doctor!!! Now what do you think about that? I am so, so, so, so proud of him - I knew he was going to do brilliantly (now, I can say "I told you so" *ahem*) and he has earned it. He put in years and years of hard work, and now can call himself doctor without any equivocation! 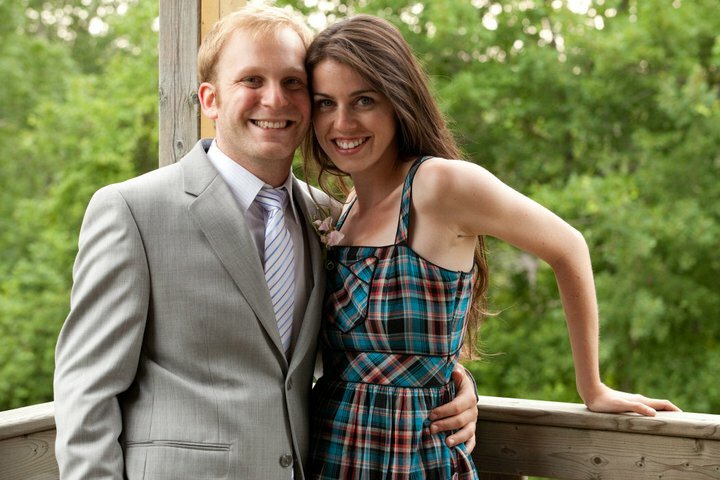 Please join me in saying congratulations to the man who has been so supportive of me for the past two+ years! I love you baby and, again, I am so proud of you - you are the bestest! 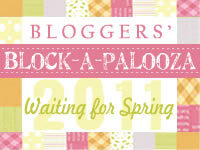 Just wanted to remind everyone that our Bloggers Block-a-Palooza quilt along is starting tomorrow. The first block tutorial will be up on John's blog tomorrow, so get ready for some fun! 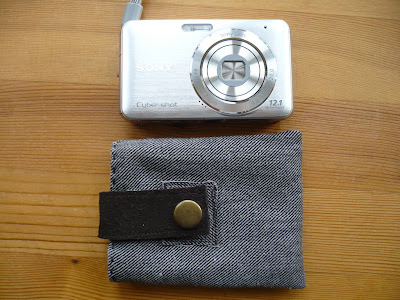 I also wanted to let everyone know that there is a Flickr group that you can join - there's info up already on fabric requirements and people have begun to post pictures of what they're using. Feel free to post pictures of your progress in the group; I'm so excited to see everyones interpretations of the blocks we've designed (especially mine *ahem*)! Miss Print <-- It's me, it's me, it's me!!! 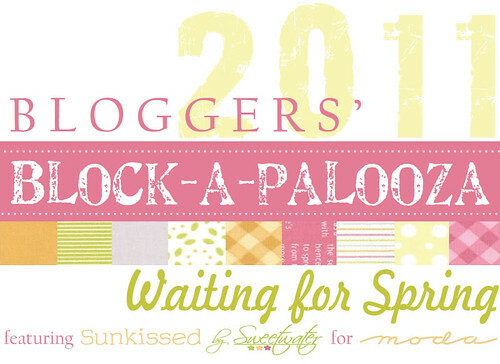 I really hope that a bunch of you decide to participate because I think it's just going to be too much fun, and with so many talented bloggers participating you're sure to end up with a lovely quilt! 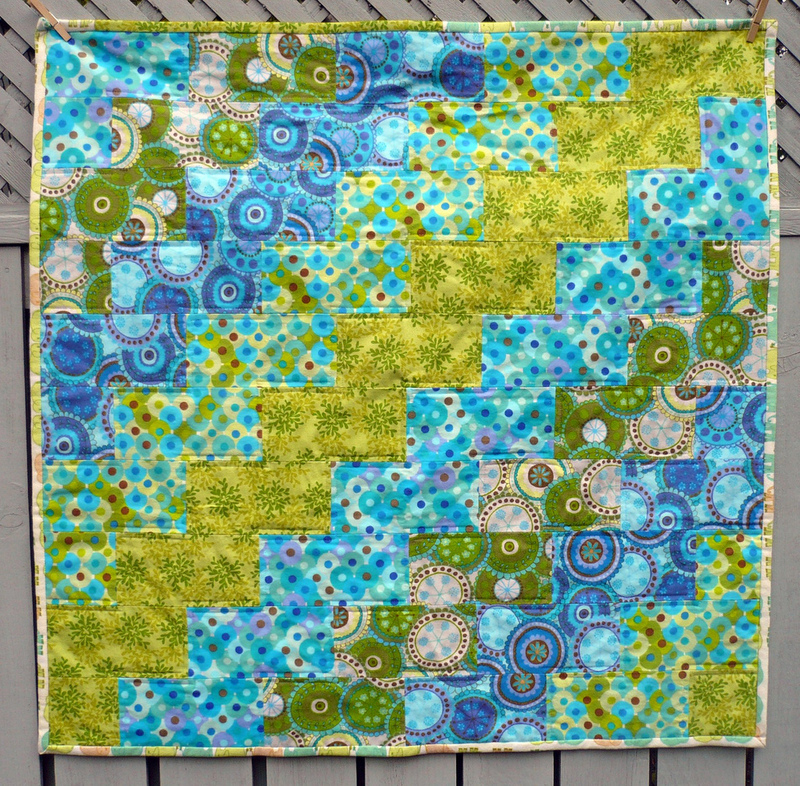 Finally a new quilt on the blog - Sullivan's Steps! Hi all! How's everyone doing? I'm getting back into the swing of school, am setting up my professional practicum (basically another part-time job), and just finished another huge quilt - which I'll be sharing with y'all in February. 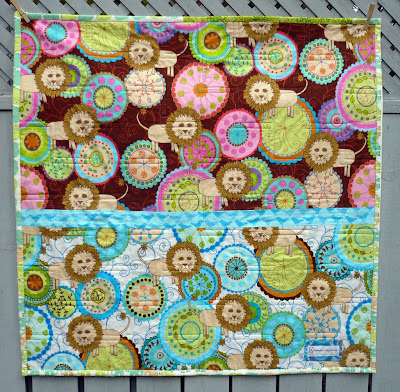 For now I wanted share with you another quilt that I finished up in October but which only got to it's recipient yesterday - yes, I hang my head in shame and what makes it even worse is that the recipient lives next door! You'll remember that back a few months ago the lovely Val sent me some cuts of her entire line of Bliss flannels. I was super-excited to receive it and after pre-washing it (oh yes, flannel MUST be pre-washed - you can read some of my tips for sewing with flannel in this post) I jumped right in and began work on this quilt. The idea for this quilt is pretty simple and am sure that there are similar patterns for using quilting cotton out there, but I wrote this pattern specifically for use with flannels (i.e. 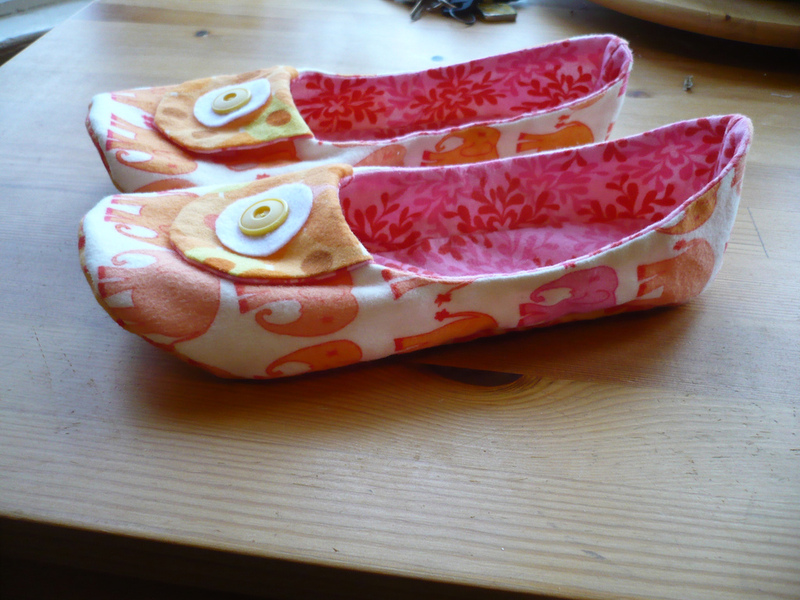 includes 1/2" seams, the blocks are a good size and shape so that they won't stretch too much, etc). This was made for the wonderful baby next door, Sullivan. Sullivan's mummy, Diane, and I are friends and she makes a great neighbour! Right after the flannels were pre-washed Diane and Sully were over here paying me a visit and Sully seemed to enjoy playing on the flannel so much that I knew he needed a quilt! I named the pattern Sullivan's Steps after him. 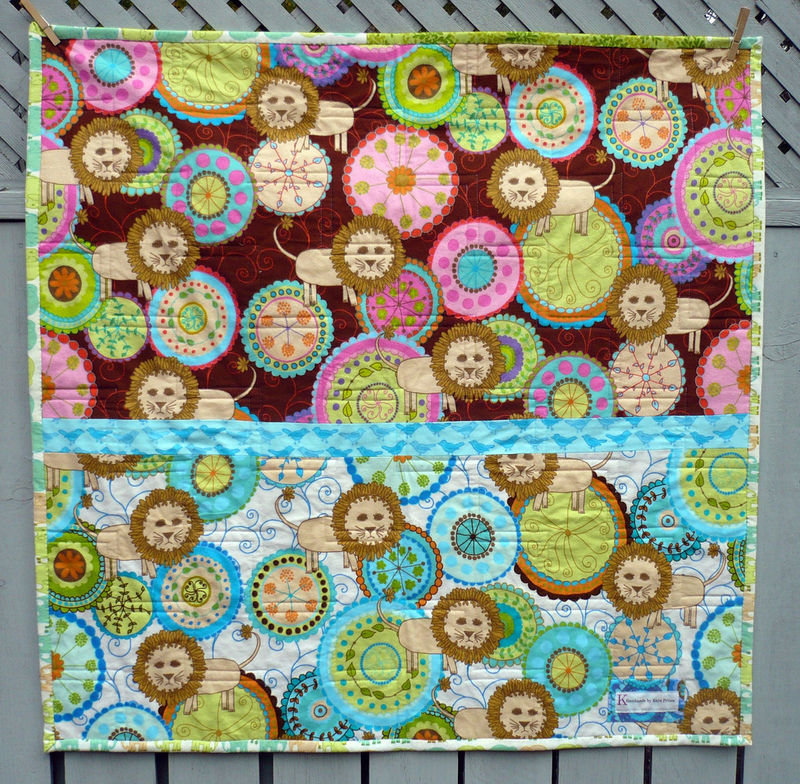 Here's a picture of the back of the quilt; I knew I needed to keep those lions intact so made use of them for the backing. 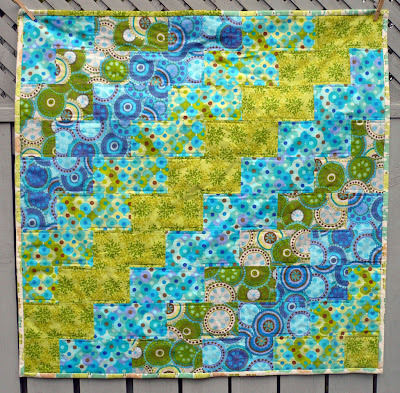 This quilt finishes up at 41" square and everything (except for the batting and thread of course) is made using Val's flannel (even the binding)! I was thinking about writing a tutorial for this pattern and posting it here on the blog as a free tutorial - what do you guys think? Let me know if that is something that you'd like and I'll get to work on it! I hope you all are having a lovely weekend - I'm off to work now! Oh Wow, 2011 Here You Are! Well hello there everyone! I took a little break there over Christmas, and managed to get quite a bit of sewing done! It was back to school yesterday for my final semester (hurray!) and now I'm trying to get myself back into the routine of school and work; hopefully I'll still be able to fit in lots of sewing and knitting, and I have some exciting projects coming up to share with y'all in 2011. I have a number of handmade things to share with you, but let's restrict this post to just the gifts. I took my Mum her tree skirt (which I share in my previous post) and she really seemed to love it! It's a bit big since she has a fake Christmas tree but it didn't look too bad. I made my Mum a few presents for Christmas (on top of getting her a few books, a movie, and doing her stocking). I made these slippers for her using some of the Bliss flannels that Val sent me a few months back. 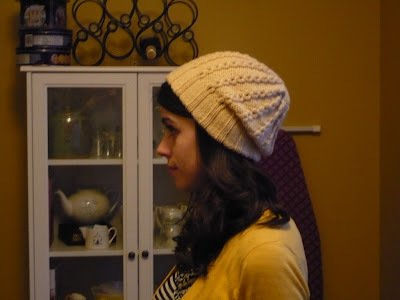 I bought the pattern from Etsy and you can find it here. They were a bit fiddly to make but I think they turned out pretty cute! 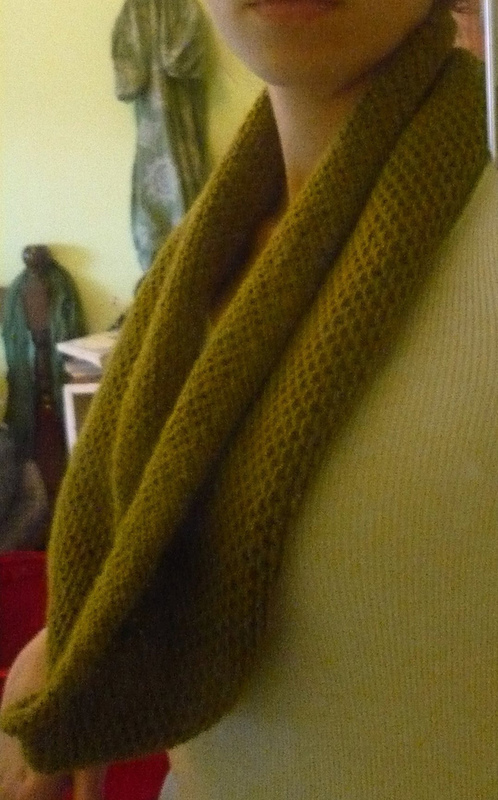 I also knitted her her own Honey Cowl using Simplicity by Hikoo for Skacel in Natural Olive. I am really no good at taking pictures of the things I've knit (especially when they're on me) so this is the best picture there is - this is also why I have not shown pictures of the first Honey Cowl I knit for myself or my Autumn. 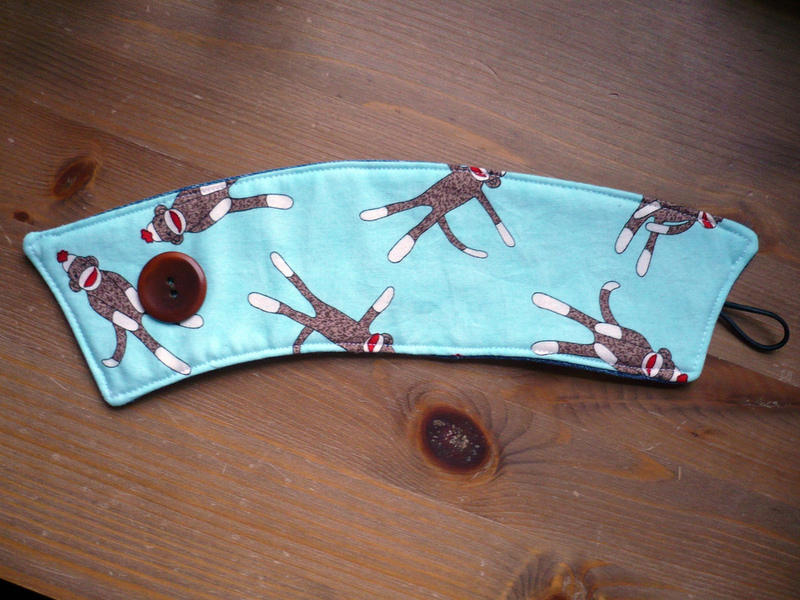 My Mum collects sock monkeys so I made her this coffee cozy too using fabric by Erin Michael for Moda. 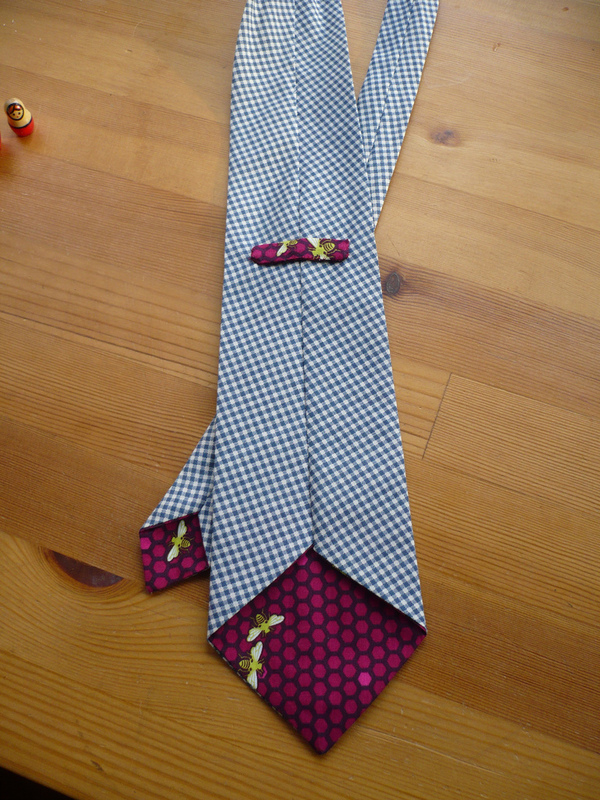 On top of getting Alex a bunch of books, some clothes, and whiskey stones (as well as a t-shirt from Etsy, moleskines, and Yiddish poetry magnets for Hanukkah), I also made him a new tie for Christmas. Both the blue check (which I think is from Cranston) and the fuchsia bees from Patty Young's Flora & Fauna were prints that Alex mentioned liking so I thought they should definitely go together! 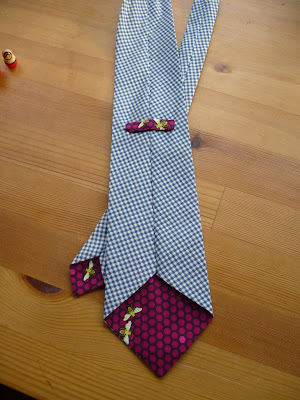 I like making Alex ties - they are relatively easy, but have a lot of impact and I love being able to customize the lining material. Yesterday was our second anniversary and I bought Alex a new digital camera - his was pretty old so he never used it. I also made him this camera cozy to go along with it - the outer lining is a cotton suiting material and the lining is a brown/black Moda solid which I think was from the Hello Betty line. The closure is a dark brown suede and I set the buttons myself - woohoo, it's always a good time when I get to use a hammer! I actually had to make the cozy twice because the first one was a bit too small and I totally goofed on the construction; I didn't really think it out as well as I should have the first time. Now let's see, what gifts did I get? Well, my Mum gave my Amy Butler's Style Stitches and the new edition of Rilla of Ingleside by L. M. Montgomery (technically these were actually belated birthday presents since one of mine had to be returned), Hilary Lang's Wee Wonderfuls and the new Whip Up Mini Quilts book. She also bought me Wives & Daughters and North & South on DVD, a grey cardigan, the Omnigrid ruler grip, and a giant new cutting mat (24x36" - one of the greatest things ever by the way) as well as a bunch of smaller presents like sewing machine needles, chocolate, and rotary blades. The biggest present of all that she got me though was the new iPod Touch 4G - my iPod (which I've had for years and was already used when I got it) gave out a month before Christmas and I probably would gouge my eyes out if I had to work without my podcasts. For our anniversary, Alex bought me the Elsa Peretti Color by the Yard bracelet with aquamarine from Tiffany & Co. I have to take it in and have it sized though because I have super-teeny wrists and it's way to big for me. We also went out for dinner and had Indian food - yum! I'll be back soon with more of the stuff I've been sewing up! 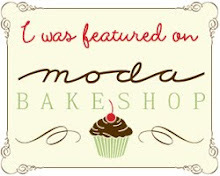 I hope you all had a lovely holiday, took some time to relax, and are looking forward to all that you can accomplish in 2011!